24th January 2012 Added the December Meeting. Tuesday, 4th October at 7.30pm. "The Annual General Meeting, AGM". Certificates were presented to the winners of the August Constructors Competition, followed by the award of a plaque to the member voted for by fellow members as Amateur of the Year. 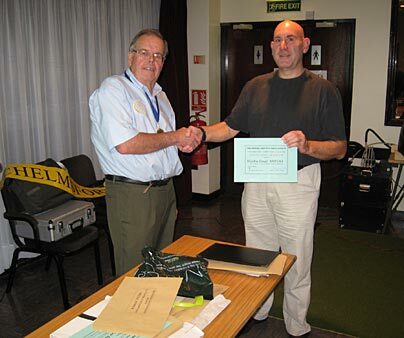 (Left) Martin, G4TOO receiving the Certificate for the First Time Winners Award for his HF Tuner. 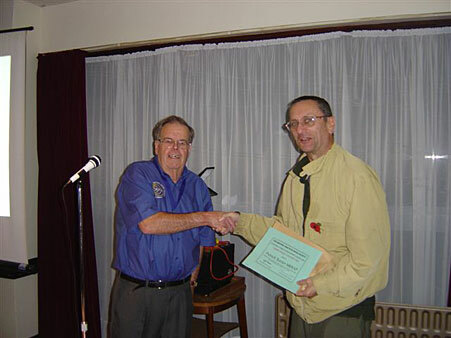 (Right) Peter, G3SUY receiving his Award from President Carl, G3PEM. Patrick, M0XAP was not able to attend to receive his Award. 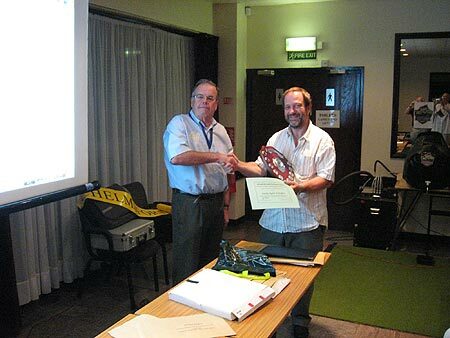 (Left) Andy, G1GKN receiving the Certificate for the Winning entry and the M1FDE Award. 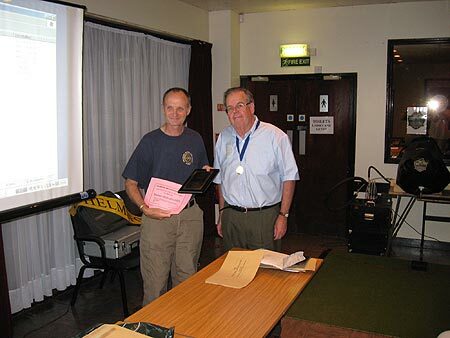 (Right) Colin, G0TRM receiving his Certificate for 2010 "Amateur of the Year" Award. 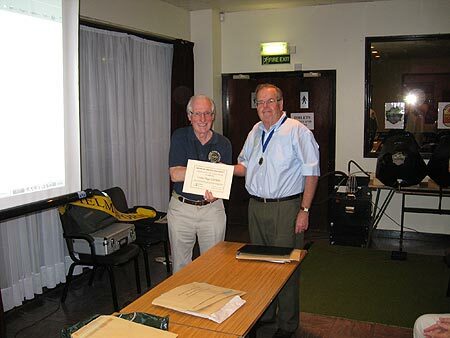 (Left) Life Fellow, Harry, G5HF handing Carl a Certificate. 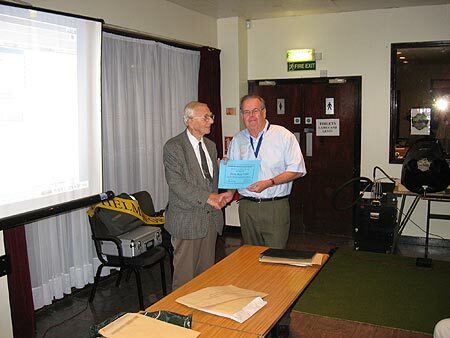 (Right) Martyn, G1EFL receiving his Certificate for 2011 "Amateur of the Year" Award. 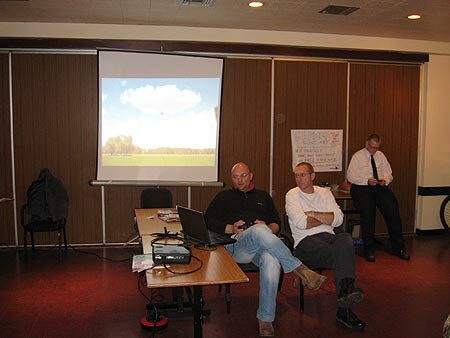 (Left) Brian, G3CVI presenting the Accounts. (Right) Mark, M0IEO presenting the Training Report. The 2010-2011 Committee were elected "en Block" and Peter Sipple, 2E0PSL was Elected to join the Committee. What would you like to hear/see/do next year? This was the question which did produce a number of useful suggestions. Members requested "something on Batteries" and Carl said he would do another "80M Activity Event sometime in January". 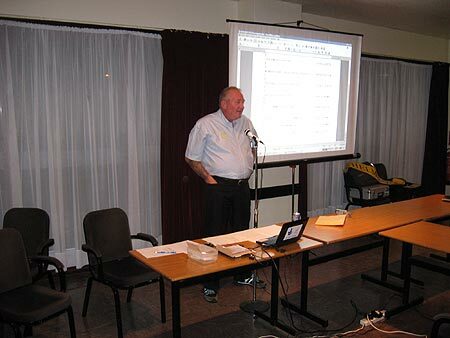 After the AGM, Mark, M0IEO sat at the back and discussed Programming of VHF/UHF rigs. John, G8DET showed the DVD of the Scouts talking to the ISS at Hylands House during the Jamboree followed by a slide show of pictures taken during the previous year. Luke, M6LNT drew the 12 prizes in the Raffle. Martin, G4TOO brought along two APC Uninterruptable PSUs for Club Funds - thank you Martin. A good AGM - thanks to all CARS Members for their support. Tuesday, 1st November. 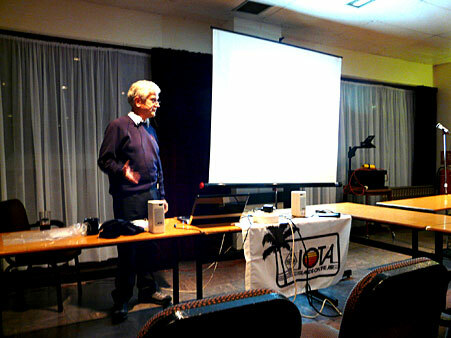 "Islands On The Air, IOTA ". 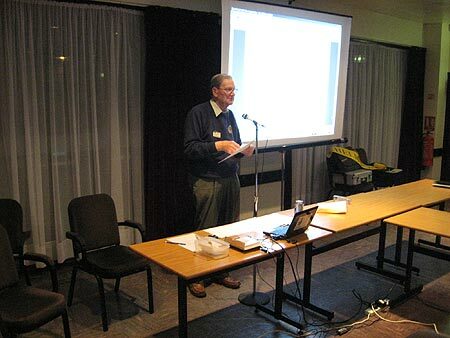 John G8DET was away, Martin G1EFL indisposed, so the meeting was chaired by our President, Carl G3PEM. Photograph taken by Vice President, Geoff, G3EDM. 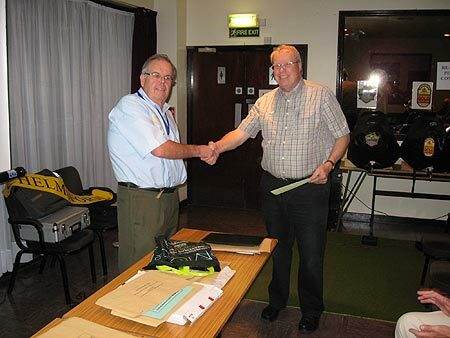 A most important RSGB matter was elucidated by RSGB Regional Manager, Mark, M0IEO. He reminded us that the RSGB was having financial and managerial problems. In the most recent issue of RADCOM these were drawn to our attention. It has been decided to co-opt people of sufficient calibre to steer the RSGB through these difficult times, and to put each candidate up for election to the steering committee by means of a national RSGB vote. The voting form is in the current RADCOM. All RSGB Members were requested to Vote. 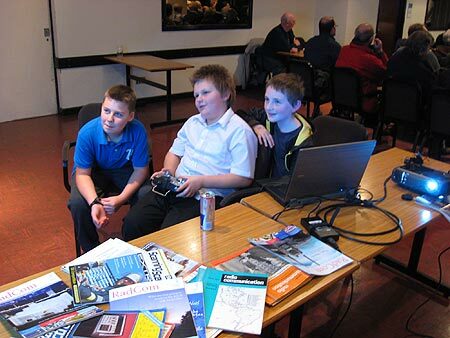 Patrick M0XAP reminded us of the Canvey Rally on Sunday 5th February 2012 at The Paddocks. A further reminder: - The Christmas Lunch is on Saturday 3rd December, a very reasonable £10.00 per head, at the Lodge Country Inn, Hayes Chase off the A132 Burnham Road. There’ll be a raffle! CARS President presenting Patrick, M0XAP with his Constructors Competition Certificate. Photograph taken by Colin, G0TRM. 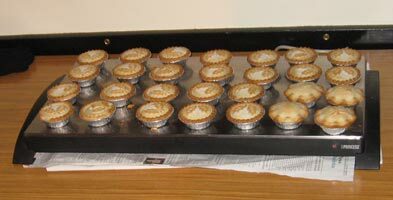 The club raffle this evening was run as ever by Peter G0KSJ. Carl introduced Radcom columnist Martin Atherton, G3ZAY. The main part of the meeting was given over to “Islands on the Air” or IOTA as it’s widely known, and the came to talk to us about it. Islands are grouped under IOTA numbers; one can contact one of the group or one can go to that island and operate from it and claim the point thus. Not all islands count! Rhode Island doesn’t qualify! Islands in inland lakes don’t count, likewise estuarine islands where the river is <5km wide don’t count, and other rules have been added as demand rose. Score one point per group. Entry level is the 100 certificate; the South Shetland Is. helpfully count as Antarctica please note. Photograph taken by Geoff, G3EDM. We were then shown Martin’s favourite overseas island haunts, including Baffin, and how to get there. Elsewhere, Palmyra Island acquired a wrecked aircraft; though some hams were thus injured the team made 4000 qso’s before being ‘medivac’d’ out. There are about 3000 folk on the IOTA register who’ve scored, with 5500 who’re building their total towards same. After the break, we were shown pictures of Ascension and Falkland Is, and St Helena. Getting there is costly. The BBC is well represented in Ascension with several 50Kw transmitters! Martin is off to Tristan da Cunha and Gough Islands in September next year, so look out for ZD9ZA and/or ZD9UW. Carl then thanked Martin for coming from Cambridge to give such an amusing and informative lecture, and a heartfelt round of applause followed. 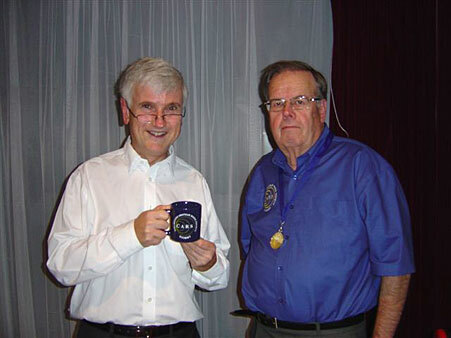 Martin being presented with a CARS Mug - a cherished item - by Carl. Martin may be able to present a photograph from an IOTA Island to add to "CARS Mug Shots" - see Web Site item. Tuesday, 6th December at 7.30pm. "Radio Control Modelling". 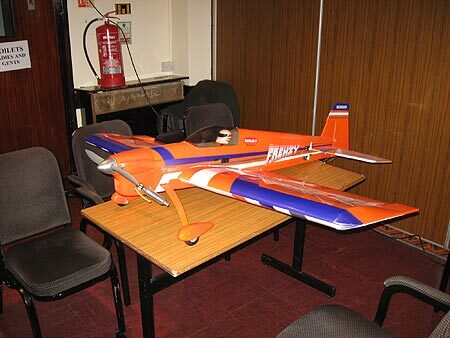 by Chelmsford Model Flying Association Member, Chris Collins. 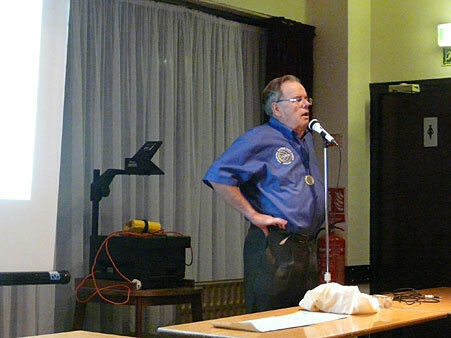 Chris thanked John for inviting the Association Members to come to talk to CARS about the Radio Control of models – in particular Dave Saban and Gavin Murrell (Members who supported Chris) are heavily into helicopters and he would answer that question later on. 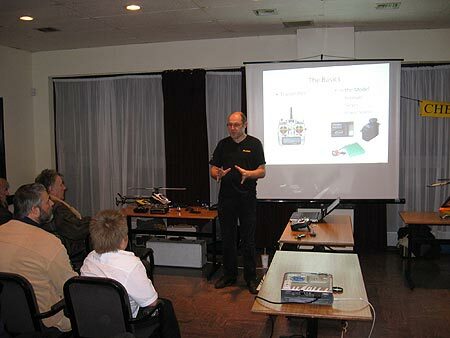 Chris went through the past stages in the hobby which were very similar to the Radio Amateur. In the very early days one had to construct both the transmitter and receiver from scratch, graduate to construction from kits and finally professionally constructed models complete with radio installed and working from “being unpacked from the box”. 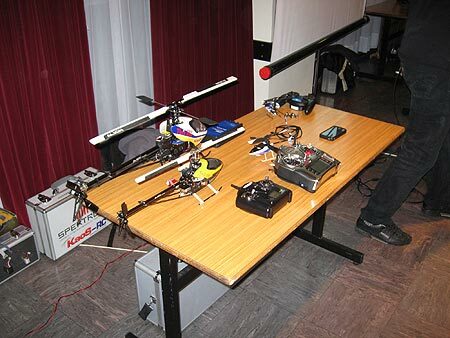 Dave demonstrated the control which can now be achieved by flying an indoor electric helicopter around the end on the room (but not over the audience). Later, in response to a question, he said they did take it one day onto their flying field but it went one way only - with the wind! Only on a completely wind-free day would it fly under control. 27Mhz was the original frequency using AM but interference from the CB fraternity caused them to move to a dedicated 35MHz frequency but they have now migrated to 2.4GHz where they are using Pulse Code Modulation and digital encoding with 100mWatts of TX power. 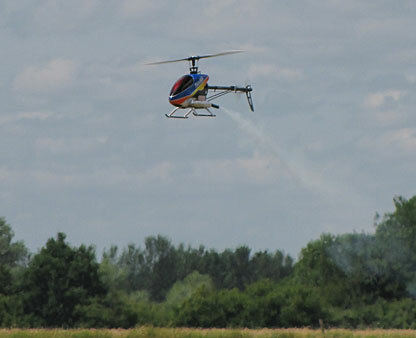 CAA rules mean that to fly the more powerful models they have to go out into the countryside where they are well away from computers and WiFi equipment so they now enjoy interference free control for the very first time. Models were originally made from sculptured Balsa Wood, Polystyrene and varnished covering (paper, silk & nylon fabric) but now the use of Carbon Fibre and Aluminium has revolutionisted and reduced the prices of the hobby. It also means that in the event of a forced landing much less of the model is damaged. 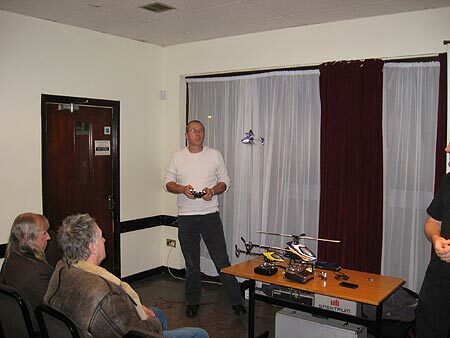 While Chris was telling us the above he was showing the large audience his model helicopter. At the opposite end of the room CARS set up another screen, digital projector and connected it to Dave’s computer where it ran a very realistic Flight Simulator to train persons on how to use the Model Controller – if they made a mistake and the model was seen to crash – no damage was actually done – wonderful. Engines were discussed – small petrol and diesel (Glow Plug) had given way to electric which can even produce 16 Horse Power! A picture of small Jet Engines were also shown but these are really for professionally made models for the film industry and cost thousands of pounds. 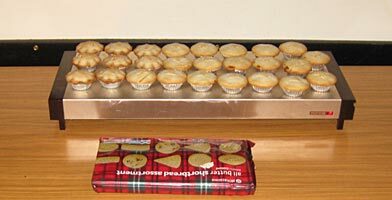 During the Break warm Mince Pies and Shortcut Pastry was enjoyed having been prepared by Dave Bolwell, David and Myra Davis – thanks - it was appreciated by all. Luke pulled the winning tickets out of the Raffle basket organised by Peter, G0KSJ – thanks to all who donated lovely Raffle Prizes – much appreciated. Chris resumed his presentation by showing another Club Member who not only flies his helicopter up-side-down but makes a habit of using it to cut grass! 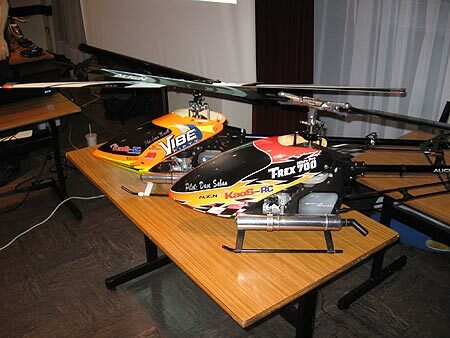 A Speed Record for a helicopter was also shown at 260kph – it was really motoring. Thank you Chris, Dave and Gavin - a fascinating presentation nicely put over by three experienced modellers. Martyn, G1EFL, CARS Merchandising Manager produced three CARS Mugs which were presented so that each time they were used at a model meeting they would think of their evening with CARS. 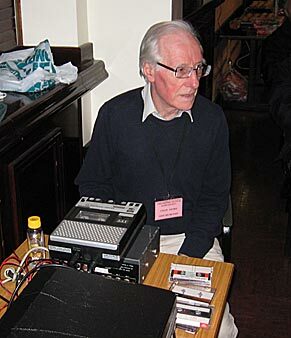 Thanks to Colin, G0TRM for doing the Sound - without which little would have been heard. Colin, G0TRM who did a great job on the sound. Stow Maries Great War Aerodrome, Essex. CM3 6RN. To show its respect and support of the Royal British Legion’s work the Aerodrome was OPEN to the public, free of charge on Friday 11th, Saturday 12th and Sunday 13th November. This event was to commemorate all those that have given their lives and those that still need support after their service to this country. Entrance was free but any donations given on site went entirety to the Royal British Legion. 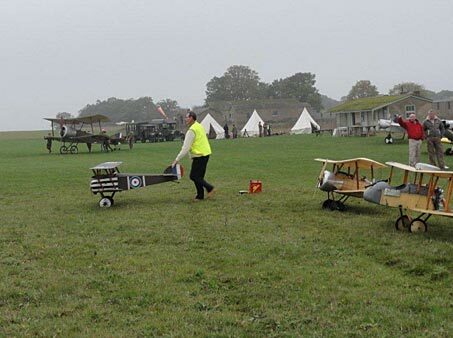 The site has just taken delivery of two Great War replica aircraft which will be on display, the Museum was open, the Dawn Patrols 1/3 scale Great War flying Radio Controlled Models will be on site as will re-enactors to add atmosphere to the event. CARS is pleased to learn that a number of Members were able to visit the Aerodrome and had a great visit. Photograph taken by Dave Bolwell, ex G3JCM. Dave said that in the air it was not possible to detect which was Model and which was full size.